If you can't add or use a printer, try resetting the printing system. The Mac's printing system is pretty robust. In most cases, it's downright easy to install printers and scanners with just a few clicks. Even older printers that don't have current printer drivers can be installed using a manual installation process. But despite the easy setup process, there may be times when something goes wrong and your printer fails to show up in the Print dialog box, no longer appears in the Printers & Scanners preference pane, or is listed as offline, and nothing you do brings it back to an online or idle state. Check the printer for ink/toner and paper. Cycle your printer off and on. If it's a USB printer, disconnect it and then reconnect it. Use Software Update or App Store (under the Apple menu) or visit the printer manufacturer's website to see if there are any newer versions of your printer's software or drivers available. Delete and reinstall the printer in the Printers & Scanners preference pane. If you're still having problems, it may be time to try the nuclear option: clear out all of the printer's system components, files, caches, preferences, and other odds and ends, and start with a clean slate. Deletes all printer queues and any print jobs that may be within the queues. Resets all printer settings to the factory defaults. Removes all printer preference files. Performs a permissions reset on your Mac's /tmp directory. Removes any printers or scanners previously added to the Printers & Scanners preference pane. Select the Printers & Scanners preference pane. In the Printers & Scanners preference pane, place your cursor in an empty area of the printer list sidebar, then right-click and select Reset Printing System from the pop-up menu. You will be asked if you really want to reset the printing system. Click the Reset button to continue. Select the Print & Fax preference pane from the System Preferences window. Right-click in the printer list (if no printers are installed, the printer list will be the left-most sidebar), and select Reset Printing System from the pop-up menu. Once the printing system is reset, you will need to add back any printers, fax machines, or scanners that you want to use. The method for adding these peripherals is slightly different for each of the various versions of OS X that we covered here, but the basic process is to click the Add (+) button in the printer preference pane, and then follow the onscreen instructions. The two guides listed above were written for OS X Mavericks, but they should work for OS X Lion, Mountain Lion, Mavericks, Yosemite, or later. 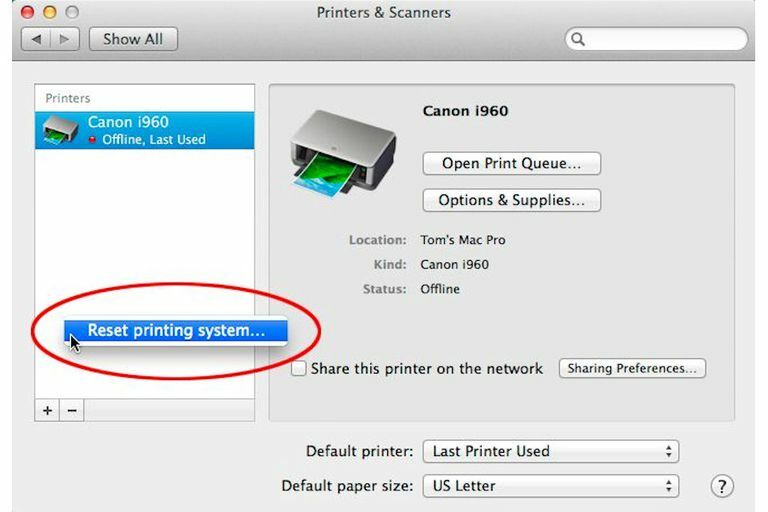 To install printers in versions of OS X earlier than Lion, you may need the printer drivers or installation apps provided by the printer manufacturer.